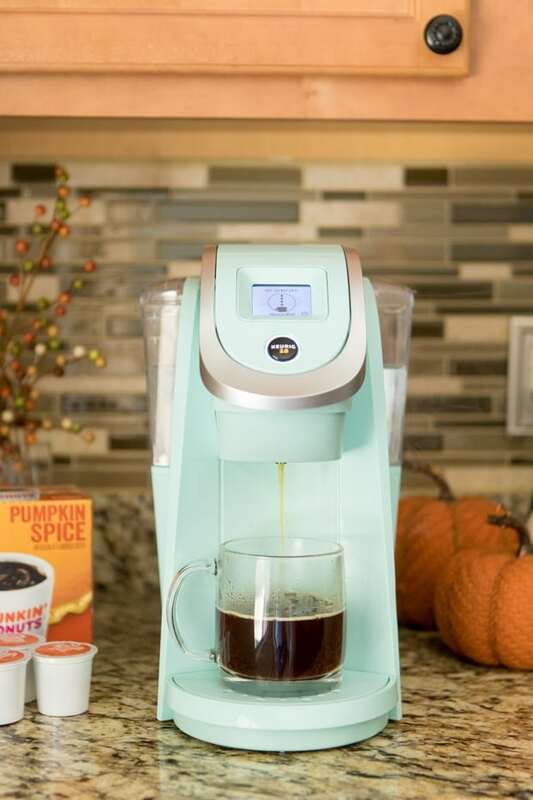 This delicious and easy homemade Dunkin’ Donuts® Pumpkin Spice Flavored coffee will leave you craving more! This post is sponsored by © the J.M. Smucker Company. All opinions are my own. You guys, I love fall. Love, love, love. I live in Michigan and I’m glad that we get to enjoy seasons here. While I believe there are perks to every season, fall has always been my favorite. There is so much to enjoy: back to school season, sweaters, scarves, boots, crisp leaves, football, bonfires, warm scents baking in the kitchen and pumpkin. I love me some pumpkin! Like…. give me all the pumpkin, please. I use pumpkin in every.little.thing during the fall months. 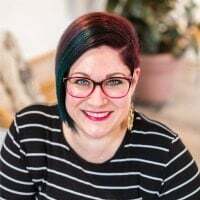 Which brings me to today’s story: one of my dear friends contacted me the other day and asked if we could get together soon – I haven’t seen her in eons and I was excited to catch up. I suggested coffee at my house after the morning school drop off and she readily agreed. Kim is one of those buddies that you don’t see nearly as often as you would like but the moment you’re together, it’s like no time has passed and nothing has changed, and you pick right up where you left off the last visit. She’s one of those rare people where you can be laughing hysterically one minute over something silly and a moment later be having a deep conversation about world views. We met because our oldest boys became friends the first day of kindergarten. The boys hit it off and thankfully so did we. Many play dates resulted. As the boys got older and joined different activities, there sadly weren’t so many play dates together. We’ve replaced those play dates with dinners, drinks and coffee dates whenever possible. Which just isn’t nearly as often as I would like — but I’m glad for each one we do squeeze in our busy calendars. So when we set this coffee date, I knew exactly what I was going to serve. Because we’re now in full on pumpkin season and I couldn’t be happier about it! Dunkin’ Donuts® coffee has long been a favorite for me and I look forward to the release of their Pumpkin Spice Flavored coffee each fall. I couldn’t wait to share a mug of it with Kim! I do a happy dance every year when it’s Pumpkin Spice time. To me, it’s the welcome wagon of the autumn season and all the things I love about it. There is something so cozy and welcoming about fall. I love all the inviting, warm flavors and smells. If I’m honest, I totally stock up during the fall so I can enjoy it past the “season”. 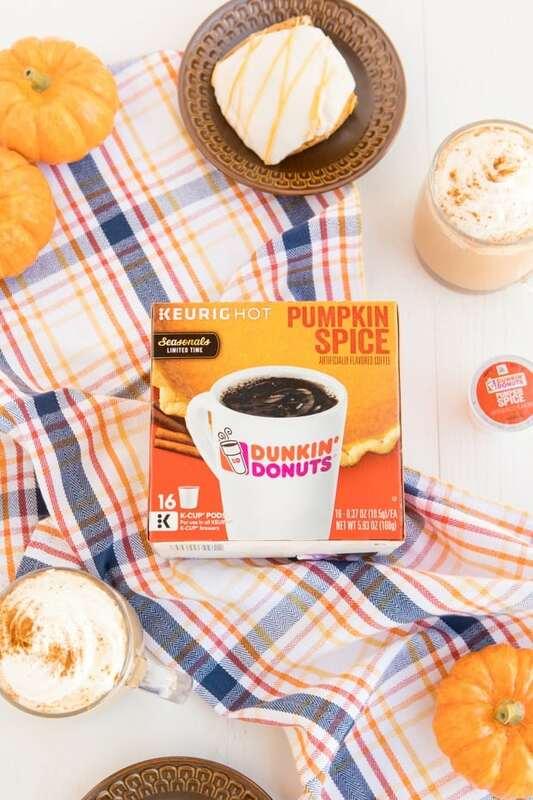 Dunkin’ Donuts® Pumpkin Spice Flavored coffee is available on walmart.com right now. It’s available in a bag or in K-Cup pods for single serve brewing machines. Be sure to snag some soon! I love the convenience of popping a K-cup pod in my single serve brewing machine for a fresh mug anytime I want one. Which is regularly and often throughout the day. Mama needs her caffeine to power through! I usually drink my coffee with a little heavy cream. But since Kim was coming to join me, I decided to dress it up a bit and make homemade pumpkin spice lattes for us to enjoy together. This recipe is simple and tasty — you’ll love it! 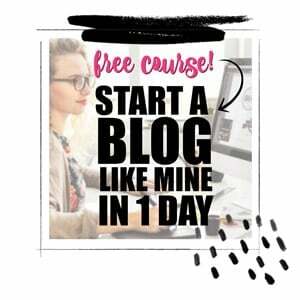 Everyone will think you slaved over it because it’s so good… and you can pretend you did if you want to. 😉 But in reality, it’s easy peasy! What is in a Pumpkin Spice Latte? Ever wonder what creates the magic of pumpkin spice lattes that everyone talks about and craves? It’s not complicated! 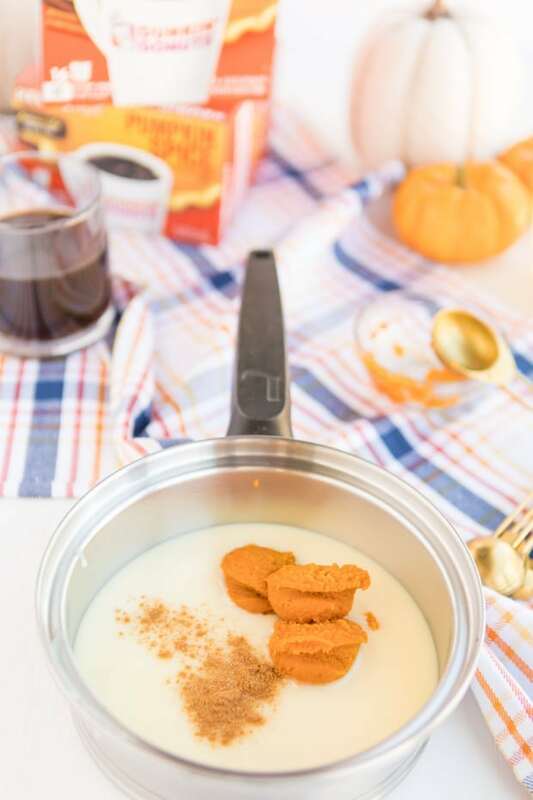 We’ll be using sweetened condensed milk, pumpkin puree, pie spice, whole milk and a pinch of salt. Gather those ingredients and let’s get started. It only takes two minutes to create the magic! Combine all ingredients in to a small sauce pan and mix over medium heat until smooth and warm to the touch (about 1 minute). Pour in to your favorite coffee and top with whipped cream. You can dress is up with a dash of pumpkin pie spice or nutmeg if you’d like to. The pumpkin spice lattes were a big hit with Kim. I knew they would be! And as predicted, we had a fantastic time catching up. 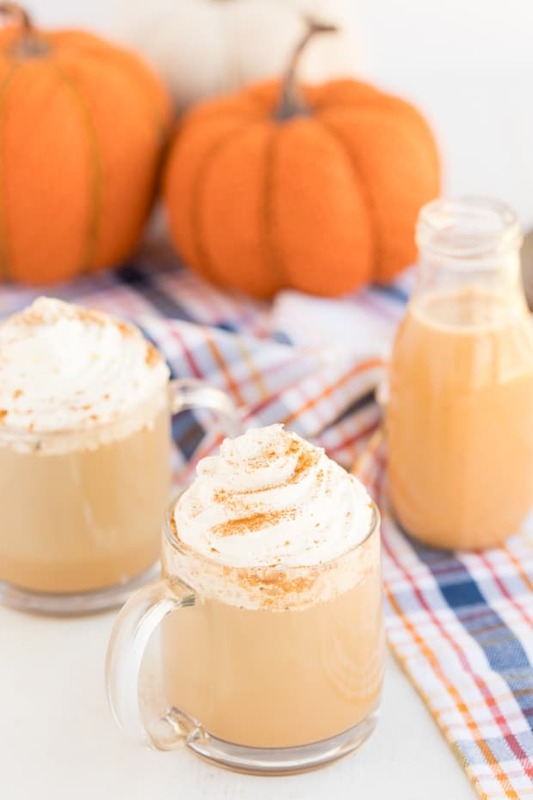 I hope that you are able to enjoy all the magic of autumn and have several of these delicious pumpkin spice lattes while you’re at it! This autumn favorite is easy to make at home and delivers a wonderful, inviting flavor. Soooo delicious! I love it.